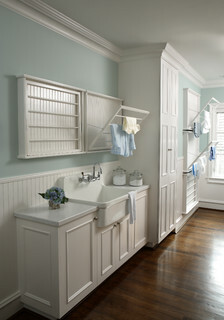 The laundry room is one of those spaces that, if you’re lucky enough to have one, is always in use. If you have a large family, your laundry machines are likely running every day — sometimes even every night. With so much time being spent in these hardworking spaces, it’s worth taking the time to make them as functional and efficient as possible. Pullout drying racks, expansive folding counters and plenty of storage are sure to help you get the job done, but don’t overlook pet-washing stations or wine refrigerators. Taking up the largest chunk of the most popular photos from 2014 had to be those concerning pets. Pet beds, pet washing, pet wallpaper — it didn’t matter. If it had to do with pets, people were all ears. If these photos are any indication, 2015 will continue to be the era of the drying rack. 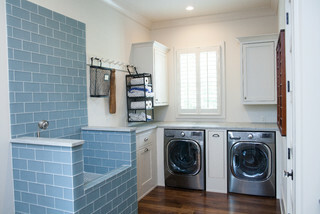 This 10-foot by 18-foot galley-style laundry room was one of the most popular laundry room photos in 2014. What did users love about it? Well, almost everything, from the five custom-designed drying racks — two of which have beadboard backing — to the apron sink and rainwashed paint color on the walls. Traditional Laundry Room by Atlanta Architects & Building Designers Rabaut Design Associates, Inc.
Stay Tuned for more laundry room ideas!